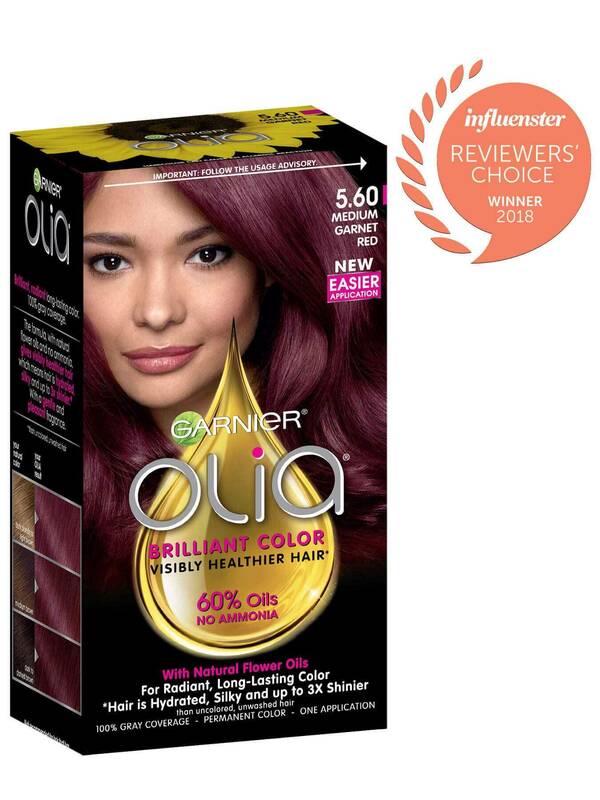 Garnier Olia shade 5.60, "Medium Garnet Red," was specially designed with patented high tenacity dyes that stay true to tone and resist fading for the most brilliant and long lasting red color result. 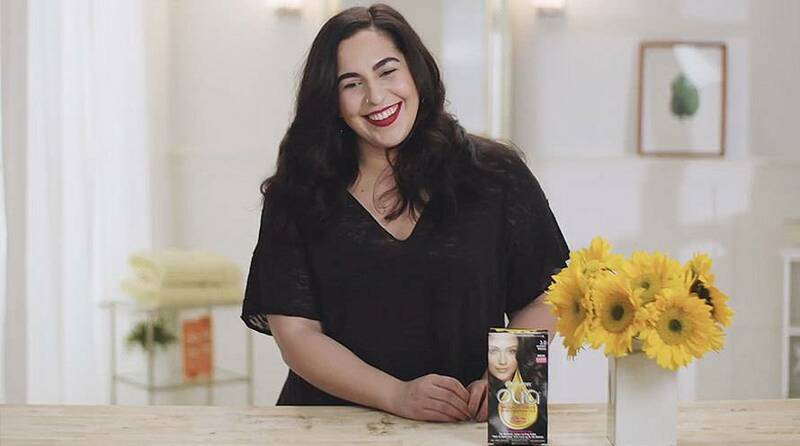 It is best for anyone with natural hair between light brown and darkest brown. If you prefer a lighter shade that has similar reflects, try shade 6.60, "Light Intense Auburn." If you would like to remain in the medium brown range but would like to try other reflects and tones, there are many shades to choose from including 5.0, 5.03, and 5.3. *For women with currently color treated hair, there are special considerations for the color result you can achieve. Because of this, we do not recommend shade 5.60 for hair that has been previously colored shade 3.0 "Darkest Brown," or darker. For more help, use our Shade Selector Tool to find the perfect shade for you! COLORANT:1126292 PARAFFINUM LIQUIDUM/MINERAL OIL/HUILE MINERALE, AQUA/WATER/EAU, ETHANOLAMINE, STEARETH-20,CAPRYLYL /CAPRYL GLUCOSIDE, POLYSORBATE 21, HYDROX YE THOX Y AMINOPYRA ZOLOPYRIDINE HCL, STE ARE TH-2,4-AMINO-2-HYDROXYTOLUENE, p-AMINOPHENOL, ASCORBIC ACID, SODIUM METABISULFITE, THIOGLYCERIN, POLYQUATERNIUM-67,TOLUENE-2,5-DIAMINE, HELIANTHUS ANNUUS SEED OIL/SUNFLOWER SEED OIL, 2-METHYL-5-HYDROXYETHYLAMINOPHENOL,LIMNANTHES ALBA SEED OIL/MEADOWFOAM SEED OIL, CAMELLIA OLEIFERA SEED OIL, PARFUM/FRAGRANCE, PASSIFLORAINCARNATA/PASSIFLORA INCARNATA SEED OIL, EDTA. F.I.L.# D163137/4 US PATENTS: 6,673,124; 7,060,107; 7,153,331; 7,635,394;7,927,383; 7,931,698; 7,972,387; 7,988,737; 7,988,738; 8,002,847; 8,066,781; 8,070,831; 8,114,170; 8,142,518 US PAT PENDING"
Rated 5 out of 5 by Queen Gee from Gorgeous color!! I purchased this today at Rite Aid and absolutely love it already even though my hair hasn't fully dried yet LOL! Love that it's ammonia free and has no harsh scent to it! I did notice I missed a few spots though. How often can you use this color again after first application? Rated 5 out of 5 by Hailee from My New Brand I just dyed my hair yesterday, I did an ombre on myself. I used a Deep Burgundy on dark brown hair. I love the Results! Rated 1 out of 5 by Ash1 from would not recommend!! Only had it in for about a week and instead of red its a half pink half purple red with blond patches. My natural colour is a dirty blond! And i only dye my hair twice a year ( which ive been doing for 15+ years ). Its horrible .have never had this issue befor and im not impressed ! Rated 5 out of 5 by Sleeping beauty from Red hair is beautiful! Love the color it's beautiful and natural looking! Rated 5 out of 5 by Irvixen from My favorite hair color This color is amazing! I have dyed my hair for 20 years- always loved reds. 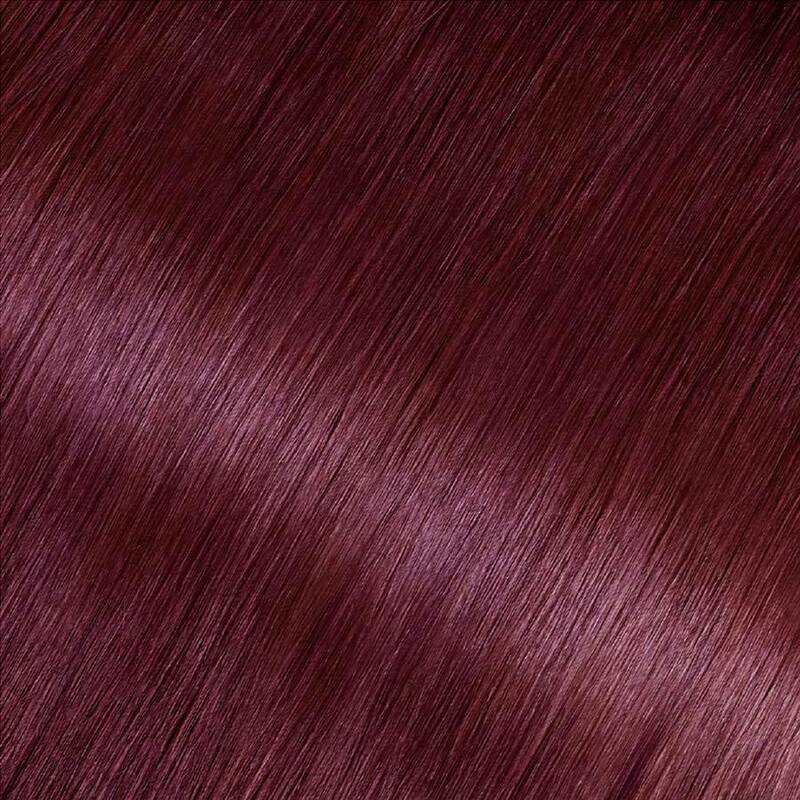 This color is beautiful, and my hair is shinier and healthier than it has been in years. I have also used several other Olia colors and loved every one. The brunette was so rich! Many compliments with using your product and I thank you!! Rated 3 out of 5 by Christel from Happy with color but application was frustrating. I am pleased with the color my hair took with this product. The shape of the applicator bottle made it difficult to apply though. I have long and thick hair so I need to use both hands to apply color. With wet gloved hands the bottle was so hard to squeeze and I kept dropping it. It takes a while to rinse out as well, even with massaging the hair first. Also, I was surprised at how dry my hair was, very tangled and not easy to brush. Usually with other types of hair color my hair is super silky after the conditioner application. I had to use a lot of hair serum to comb. A positive note: not messy and no burning eyes! !